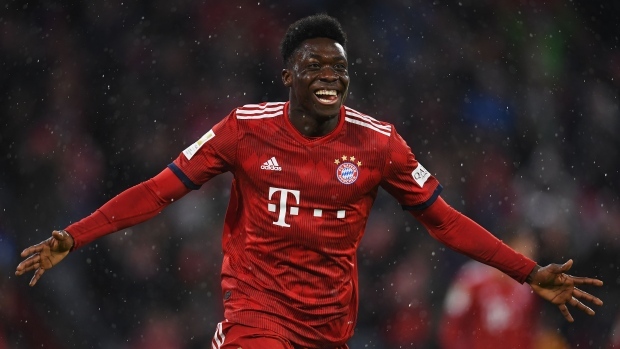 BERLIN — Canadian teenager Alphonso Davies opened his account for Bayern Munich with a goal off the bench Sunday in a record-setting 6-0 rout of Mainz. Introduced in the 59th minute, Davies was in the right place at the right time in the 70th minute, acrobatically using his left foot to knock in a rebound from a Robert Lewandowski shot. Davies then raced to the corner, sliding to his knees to celebrate. "The first of many," tweeted Bayern. Davies, 18, became the first Canadian goal-scorer for Bayern and the first Canadian to get a goal in the Bundesliga since Marcel de Jong in 2013. He also becomes the youngest Bayern goalscorer since Roque Santa Cruz in 1999. Born to Liberian parents in a Ghana refugee camp, Davies grew up in Edmonton before moving to Vancouver to further his soccer career. Davies, an attacking midfielder with nine caps for Canada, joined Bayern from the Vancouver Whitecaps in a then-MLS-record US$22-million transfer deal that will see him play for the German side through 2023. The deal was consummated in July but Davies closed out the MLS season before joining Bayern in January. The victory returned Bayern to the top of the Bundesliga, more than answering Borussia Dortmund's challenge a day earlier. Bayern set a league record for scoring five or more goals in three consecutive games after last weekend's 6-0 rout of Wolfsburg which followed a 5-1 win at Borussia Moenchengladbach. Robert Lewandowski, James Rodriguez and Kingsley Coman scored in a one-sided first half, before James completed his hat trick and Davies grabbed his first goal for Bayern. James became the first Colombian to score a hat trick in the Bundesliga. Bayern, the six-time defending champion, reclaimed the lead on goal difference from Dortmund, which had put the pressure Saturday with a last-gasp 3-2 win at Hertha Berlin. With eight rounds remaining, the April 6 clash between the two rivals could be a potential title-decider. Bayern was keen to impress after its Champions League exit to Liverpool on Wednesday. Lewandowski got the side off to a perfect start with the outside of his boot in the third minute, James made it 2-0 in the 33rd after Leon Goretzka laid the ball off with his chest, and Coman, who earlier hit the post, let fly from the outside of the area in the 39th. James grabbed another two goals within a four-minute spell early in the second half, before Davies, who came on with just over half an hour remaining, scored with a volley on the rebound after Mainz goalkeeper Florian Mueller denied Lewandowski. Max Kruse opened and finished the scoring for Werder Bremen to beat Bayer Leverkusen 3-1 away and boost its European qualification hopes on Sunday. The Bremen captain finished off a counterattack spearheaded by brothers Maximilian and Johannes Eggestein in the 14th minute and set up Milot Rashica to score on another breakaway in the 37th. Leon Bailey pulled one back with a brilliant free kick in off the crossbar with 15 minutes of normal time remaining, but Kruse sealed Bremen's win with yet another counterattack in the fifth minute of injury time. The win lifted Bremen to eighth, three points behind Leverkusen, which occupies the last place for Europa League qualification. Peter Bosz's Leverkusen put itself in contention with six wins from its last eight games. Martin Hinteregger's first-half strike was enough for Eintracht Frankfurt to consolidate fifth place with a 1-0 win over last-placed Nuremberg. The visitors are now 20 games without a win.